This hallowed town of legendary proportions is now fighting its own battle over BT Brinjal. It is trying to save a special type of brinjal that has a heritage of 500 years. Known as Matti Gulla, it is a special vegetable endemic only to a place called Mattu near Malpe on Udyavar-Malpe road near Udupi. A small community of farmers who grow this unique type of Brinjal are now fighting against the bio-contamination of Matti Gulla. Two eminent scientists Ramesh Bhat and M.N. Madhyastha have taken up the scientific study of this vegetable in an exclusive paper produced for this purpose have guided the farmers to save their crop. The paper that has been exclusively given to Mangalorean.com brings out different views about the Matti Gulla. In a bid to get global patent, the Horticulture Department had also come forward to study this famous Udupi Brinjal. A team led by Additional Director of the Department, Dr Ramakrishnappa, had visited Mattu Area, where this special variety Brinjal was cultivated. The team is making a detailed study of this variety by collecting all available data. Brinjal has been used as a vegetable in India, since time immemorial. The classic Ramayana contains reference to Brinjal. Early Buddhist and Jain works, Sutras like Uttaradhyana Sutra, Prajapana Sutra and Jatakas record Brinjal (Om Prakash 1961) Indian subcontinent (Indo- Burma region, probably Assam) is considered as the Centre of origin of Brinjal (Paroda and Aurora, 1999). The Sanskrit name Varthaku, Vrutanka, Vaantaki, Vantika or Vatinganah is responsible for a number of names in various languages such as Badhinjan in Persian and al-badinjan in Arabic. Arabs have carried the brinjal to Europe around 16th century. 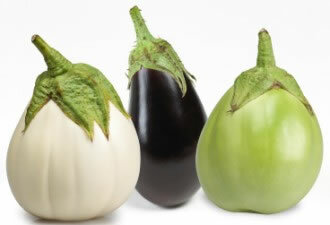 The Catalan nomenclature of albergia is responsible for the French and British name aubergine. In the North American continent it is known as egg plant since the fruit of some early varieties were all white and looked like hen's eggs. The Kannada name "Badane" appears to be closer to Persian Badinjan rather than to Sanskrit name Vatinganh. The Tulu/Kannada name Gulla seems to have evolved independently. In the eighth century work, Kashyapiyaneesha sookthi, it is mentioned that the white brinjal (egg plant) is poisonous. Probably this is the reason why it was forbidden traditionally for certain segments of the population to consume it. Brinjal is known to contain several anti nutritional substances such as steroidal alkaloids (solasonine, solamargine and solasodine), trypsin inhibitors in fruit peel, phenols, amide proteins etc. It also has high poly phenol oxidase activity and contains anthocyanins (Bajaj et al. 1979, 1982). According to a Tamil verse Katrikai may induce skin ailments such as itching, psoriasis etc. (Sairam 2000). Botanically referred to as Solanum melongena var. esculenta Nees, the colour of the fruits of brinjal vary from different shades of violet, pink, white or green. Badane commonly found all over India is elongated or round, violet/pink/white/green in colour while Gulla found in the Udupi district is round, green in colour. In brinjal local preference varies considerably from region to region and even district to district. A variety with a particular colour and size of the fruits fetching a premium price in the market may be totally rejected in another area. A classic example is the two types, Mattu Gulla and Perampalli gulla marketed in the Udupi district. The former has small spines on the stalk, while the later has no spines on the stalk. A similar variety, but without spines on the stalk of the fruit and having different taste is the Perampally Gulla (Perampally is the name of a village in the Shivalli Panchayat in Udipi Taluk). It is pertinent to note that a variety of brinjal available in Kolkata has also spines and green in colour. Arka Kushumkar, Arka Shirish, Mysore green are some of the improved varieties of cultivar of Karnataka, which are green in colour. Among these, Arka Shirish is evolved from a local type called Irangeri brinjal. (Thamburaj and Singh, 2000). Manjari Gota, Udupi Gulla, Malapur local, Kudachi local, 112-GO hybrids and Rabkavi local are the improved varieties of Brinjal developed by the University of Agricultural Sciences, Dharwad. The great reformist seer, Sri Vadiraja Tirtha Swamiji, had given special brinjal seeds to the people of Mattu village in Udipi district of Karnataka during 15th century. This brinjal, which is different from brinjals elsewhere, became famous as "mattu gulla'' and is considered sacred. It has been a tradition for the people of Mattu village to send the mattu gulla as "Horekanike" for the Paryaya, a festival held every alternate year in the famous Udipi Sri Krishna Temple since the fifteen century. It is the only variety of Brinjal used in the famous Sri Krishna Temple Udipi for preparing a variety of dishes specially Sambhar, Pallya, and Gojju. Legend has it that Saint Vadiraja gave the seeds to Mattu Villagers, asked them to grow in their area. The saint offered the fruit brinjal to the Lord for 48 days continuously as naivaidyam to get rid of the poison that has affected the idol of the Lord he was worshipping. More scientific explanation is that Saint Vadiraja had traveled all over India and has written a treatise entitled Teertha Prabandha describing the various places of pilgrimage in India. One such place is Gangasagar, Navadweepa, in present day West Bengal where the river Ganga joins the Bay of Bengal. It could be possible that the brinjal grown in that place is brought by him to Udipi and the seeds given to villagers of Mattu since the geography of Mattu closely resembles that of Gangasagar i.e. river mouth joining the sea with bit of brackish water area. Sri Vadiraj Swamiji, being a well read and widely traveled saint, must have had several scientific reasons to sanctify the brinjal and set a precedent of offering to Lord Krishna. Though the brinjal was considered a "Tamasic" product dear to Lord Shiva, as per the belief widely prevalent during that period, the work of Sri Krishnadasa entitled Krishnamangala written during 1525 AD listed items cooked by the Gopis and Gopas of Brindavan at the request of Lord Krishna. It included brinjal. May be this is the reason that prompted Sri Krishna Chaitanya(1486-1533) to dine at the residence of a Adaviata Sarvabhauma and consume "Shali rice, drenched in yellow ghee, surrounded by leaf cups, dhal, sag and vegetable like brinjal". (Achaya 1994). Available evidences indicate that Sri Krishna Chaitnaya, a vaishnava evangelist, had visited Udupi, the seat of the great Jagadguru Madwacharya and had a meeting with Saint Vadiraja. The Sanskrit texts dealing with Plant Sciences like the Brhutasamhita of Varahamihira (6th century AD), Sarangapaddahathi of Sarangadhara (13th century) and the Vrukshayurveda of Surapala composed any time during 10th to 14th centuries refer to issues such as nourishment of plant, organic fertilizers, their species specificity etc. The month ideal for planting brinjal, organic fertilizers that would be responsible for producing seedless fruits of brinjal, the technique of producing brinjals of huge size etc find a place in these texts. ( Sadhale 1996). The 500 year old system followed for producing brinjal in the Mattu village, which is prevalent even today, viz., use of organic fertilizer from the local fish variety such as "Bhuthai" leads it to believe that the cultivation practices could have been influenced by these manuscripts. The findings during 2006, made by Richard Bardgett and his colleagues from the University of Lancaster and British Institute Grassland and Environmental Research, using most modern radio isotopic techniques that organic nitrogen can be directly taken up by plants and used differently by different species support the scientific validity of the ancient writings. Thus the practice followed by the Mattu villagers in cultivation of Mattu brinjal stands scientific scrutiny. The skin is thin, virtually gets dissolved on boiling. Less astringent than other varieties of Gulla/ badane. Seeds are less in number, no bitterness in seeds. After cooking the fruit pieces retain their firmness, in such a way that in preparations like sambhar when boiled with redgram it does not get disintegrated. Also it is smooth in consistency and does not leave any fibrous material. It has a special flavour and useful for ethnic preparations like Gulla kalludijipuna i.e. a dish made of brinjal smeared with dough of rice and fried in pan . The brinjal grown in Mattu village has been considered "sacred" and having special taste since 15th century and even today its special taste is recognized and relished by consumers of brinjal in parts of Karnataka. Such a phenomena is recognized since ancient times in Greece as concept of genius loci or spirit of the place. This concept refers to the sensory food quality including smell, taste and appearance, which is specific to a particular location and which lends a particular preference in the minds of users/consumers to the product/location. There is a need to register Mattu gulla under Geographical Indication (GI) under the Geographical Indications of Goods and Registration and Protection Act 1999 for protecting its unique geographic identity. The regulations formed under the Geographical indications are protected similar to trade marks and regulations formed under this act provides total protection to registered owners against any kind of misuse of the geographical name and infringement of any kind is liable for charges of criminal offence. Geographical indication is a collective community right. Application need to be filed with the Geographical Indication Registry under the Controller General of Patents, Designs and Trade Marks attached to the Union Ministry of Commerce and Industry. The application has to be advertised in the GI journal for three months. Such a registration in India is a must since as per law producers can claim protection in other WTO member countries only if they are protected in the country of origin. Only an association of producers or an authority established under law can apply for GI registration. The registration filed this category has 10 years validity and can be renewed each time for a further period of ten years. This means, the Mattu Gulla producers association or the department of Horticulture, Udipi District, can apply for GI registration. It is a collective community right and not individual right. As many as 28 Indian products have been registered with the Geographical Indications Registry. The agricultural produce from Karnataka registered in the Chennai office so far include Nanjangudu Banana, Coorg orange and Mysore betel leaf. The Indian Agricultural Research Institute (IARI) has been developing a Bt brinjal with the gene Cry1Ab for the last several years. It is yet to reach the stage of commercialization. On the other hand, the multinational company Monsanto has evolved Bt brinjal containing a foreign gene cry 1Ac derived from a soil bacterium Bacillus thuringensis. This gene synthesizes a protein toxic to the fruit and shoot borer insect pest of brinjal. Its incorporation into brinjal kills the insect invader once it attacks the shoot and fruits of brinjal. The farmers can reduce spraying of insecticides to control the borer. The Indian company Maharastra Hybrid Seed Company, Mahyco sourced the cry1Ac gene construct for its Bt brinjal from Monsanto. Mahyco has done the entire transformation i.e. fitting the gene construct in the right place of the brinjal genome at their Jalna Centre. Mahyco has submitted a patent application for this unique event EE1 with the patent authority. This event EE1 was integrated in to eight of the company�s own brinjal hybrids like MHB 4, 9, 10, 80, 99, 11, 39 and 111. In addition it has supplied the event EE1 to University of Agriculture Sciences, Dharwad for back crossing with their several popular varieties including "Udupi Gulla". According to another report, UAS Dharwad gave seeds of its promising brinjal varieties including "Udupi Gulla" to Mahyco who backcrossed them in to a transgenic product and presented the backcrossed seeds under a USAID funded project devised by Agriculture Biotechnology Support Programme II (ABSP II) team members at Cornell University. The UAS will conduct field trials and distribute the disease resistant seeds to farmers on cost basis. Farmers can use these varieties over succeeding generations, unlike Mahyco�s hybrids that have to be bought for every fresh sowing. Although this act apparently appears to be generous, there is a catch as evident from the statement of the spokesperson of Mahyco that "the question of royalty arises only if universities undertake commercial sales". Thus what costs the farmers would have to pay for different varieties of Bt brinjal is yet unknown. Also there is every danger of the entire indigenous Mattu Gulla getting contaminated with Bt gene, once the commercial cultivation of "Udipi Gulla" with backcrossed Bt gene begins in the Mattu village. If contamination of neighboring brinjal occurs, it will be very difficult to contain it. If such a thing becomes a reality, the entire purity of Mattu Gulla which was guarded by the farming community of Mattu Village since the time of the great reformist seer Sri Vadiraja in the 15th century would be polluted and the valuable heritage of the mankind so carefully guarded would be lost forever. It is pertinent to point here that, germ plasam of most cultivated plants are carefully guarded by the Agriculture scientists both in India and infact throughout the world , by collecting different plant varieties, races and wild types and preserving them in earthquake rooms at subzero temperature to preserve the diverse gene pool for possible future use. In the wake of the modern developments in Biotechnology and the introduction of Bt Brinjal, impact of pushing the brinjal crop into an IPR regime and the consequences of the same for farmers� rights in using their own seed will be jeopardized; perpetual dependence on the external agencies will be created and the resulting consequences on the consumers need to be assessed. I hope the Matti Gulla Producers or department of Horticulture, Udupi will take the right step and protect our indigenous produce. VERRY GOOD ARTICLE ABOUT MATTU GULLA. MATTU IS MY BIRTH PLACE I LIKE MATTU GULLA & AM VERY PROUDLY SAY GULLA MEANS "OUR MATTI GULLA"
I am very proud to know that it is having a glorious history. i am very proud of it. Apart from the view of not introducing Bt Brinjals for the reason of them being genetically modified, I want to direct this issue to a different matter of fact. Indian Researchers have already developed around 10 varieties of Rice that are resistant to drought, salinity and many more to say......... that has been field tried also but not introduced yet to the masses which is needed to sustain population. They are dyeing on the verge of field tests. On the other hand in today�s date government is promoting Bt brinjal of Monsanto by totally ignoring need for its field trial and also the money and time of Indian Researchers� and Government that has been put in the field of crop improvement. It seems like that the environment minister�s decision is derived by the corruption led by the desire of Monsanto to continue its monopoly. Where the biodiversity conservation laws have gone now? The west is going Organic after tasting modified and high yielding varities.... Anything Organic is highly regarded, looked upto and eve not very affordable as it has been class qualified to be above the general range. The third world who used to be organic producers are being persued and pushed to adopt geneticaly modified varieties in the guise of high productivity. Tampering with nature... modifying the basic genetics of the natural creation is not only warranted but not desirable for the creation to sustain and progres. Why are we tampering with nature?. Why waste time and resources on creating Bt Brinjal and for that matter any other modified food. Nature has provided everything that we need. Why modify it?. These giant MNC's are using third world countries like India as Guniea pigs. Introducing such modified foods is going to create new diseases and the pharma companies will then jump in with an anitdote. this is big money for these companies, not to mention the politicians whom they have to pay to get it through. Its high time we returned back to organic farming. Felt like eating one palte of hot gulla podi.You will get it at home. Some of the restaurants in DK have it too on their menu. My favourite of course is Jeevi gujje podi. I have tried podis of different type. With hot pepper[chilli] they make podi. Goes well with curd rice.Sweet pepper podi is too well known.I remember ordering pakoras in a Chicago restaurant and being served sweet pepper podi.I did not mind it as I like sweet pepper podi as well. Coming to Pasta which I had mentioned humorously in one of my earlier posts, I find it very tasty. However no western food can compare favourably with Indian food for me.They used to serve hot pasta on American Air lines. Nit any more. You get cold turkey sandwiches.Not only costs you money but also does not taste good.